To solve problems and improve fastening results, National Rivet designs and manufactures a wide variety of rivet fastener parts and accessories. This includes special arms, feeding devices for rivets and parts, customized fixtures, compensators and point of operation safety devices. Use these accessories to maximize fastening performance or adapt a standard riveter for your individual needs. Note: Investing in quality riveting accessories is a proven method for increasing efficiency. In fact, many people blame problems on their rivets or rivet setters, when the real culprit is worn or inadequate tooling and accessories. As in integrated supplier, our engineers can quickly spot system deficiencies and recommend a new, more productive riveting solution. If you want better riveting accessories, contact National Rivet today! You can equip any rivet setting machine with special arms, anvil holders, goosenecks and anvils as necessary. Whenever possible, our engineers will recommend a standard arm. However, some applications simple aren’t possible or productive with a standard. In that case, we can custom design an arm and anvil holder, or gooseneck and anvil, to meet the requirements of your application. For example, National Rivet designed an anvil arm to reach inside of the boot of the very first in-line skate produced. Positioning fixtures are stationary fixtures designed to hold one or more components in place for positive alignment during riveting (positive alignment is critical for consistent results!). Movable fixtures can improve production efficiency and operator safety. We can engineer fixtures to move manually or automatically, as well as incorporate multiple positive stops or interlocks. Moveable fixtures allow a single machine to set multiple rivets in a part or component, or they can orient and support the part in such a way that one person can do the work of two. Maximum productivity depends on fast, accurate delivery of rivets and parts to the riveter. For example, National Rivet often recommends the use vibratory feeders to deliver rivets, unusually shaped cold headed parts, washers, electrical contacts, coil springs, spacers and other parts accurately and with great repeatability. 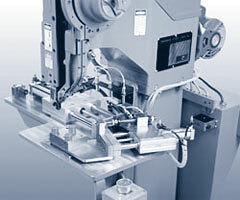 Similarly, we can design systems to transfer parts to the machine via slide, tube or automatic placement device. 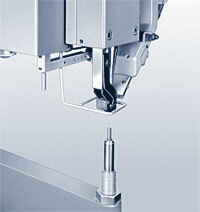 Compensators enable riveting machines to accommodate varying work thicknesses. Anvil arm compensators allow the anvil to move vertically as the rivet is driven down through the work, supporting the anvil with spring or air pressure. Top pin compensators work in a similar fashion, except that they use a spring-loaded top pivot pin. With either model, pressure can be adjusted so that each rivet is set with the same amount of pressure regardless of part thickness. IMPORTANT: Rivet setting machines should be equipped with a point of operation safety device. To Comply with OSHA regulations and ANSI standard B154.1-1984, the employer is responsible for providing point of operation safety. Because of the range of configurations and sizes of machines, nearly every assembly presents a different hazard. The following safety devices are commonly used on rivet setting equipment and can be adapted to each application to provide protection from injuries at the point of operation. Contact us to discuss your application! Shuttle Fixture. A shuttle fixture allows a machine operator to load the component parts safely over the anvil outside of the riveting area. The parts can then be shuttled into position to complete the riveting operation. 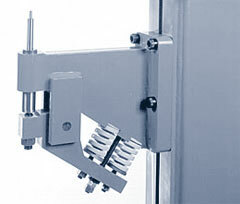 The point of operation can be guarded by either dual anti-tiedown safety switches or a single switch plus an electrical interlock placed at the shuttle fixture in stop position. Safety Probe. A safety probe is an electrically actuated device that drops a ring from the upper-most position of the jaws and encircles the entire area under the driver when the machine is tripped. If there is any obstruction between the driver and the anvil (the operator’s fingers, for example), the machine will not cycle. Dual Anti-Tiedown Safety Switches. This type of installation requires the operator to use both hands to actuate the machine. A pre-set time delay requires the operator to press moth switches almost simultaneously to cycle the machine, ensuring that the operator’s hands are safely away from the riveting area. 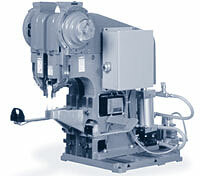 The use of dual switches often requires a work support or holding fixture to position the parts over the anvil. 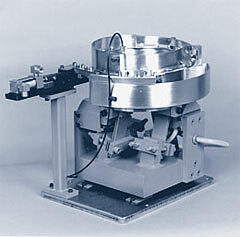 Rotary Index Table. 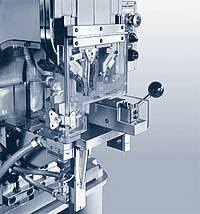 In a rotary index table, the parts are loaded well away from the point of operation. The operator’s hands are kept a safe distance from the riveting area. The rate of production depends on the time required to load the parts. Normal cycle time is the time required to load component parts plus approximately .5 second for indexing. Riveting is done during the loading process. Specializing in Engineered Cold Headed Parts and Fasteners.